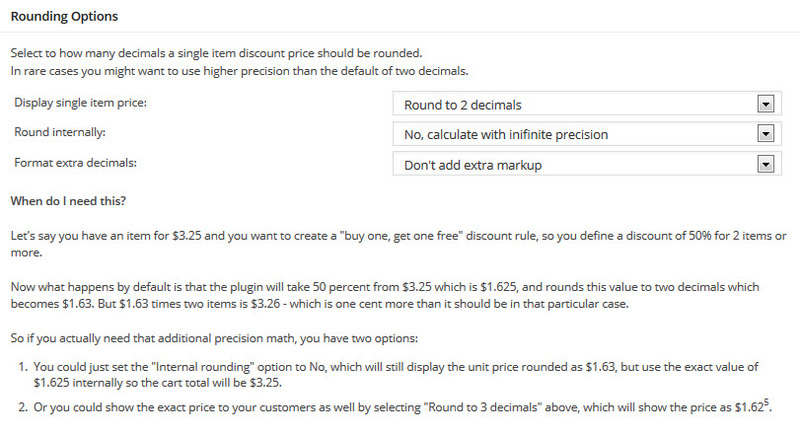 You can select to how many decimals a single item discount price should be rounded. In rare cases you might want to use higher precision than the default of two decimals. This options controls whether single product prices are rounded to 2 decimals (default) when displayed – or to a higher precision of 3, 4 or 6 decimals. This option controls whether you want the plugin to calculate with infinite precision (default) or round to the number of decimals above, which would use the “Display single item price” setting to round prices internally. When do I need extra precision rounding? Let’s say you have an item for $3.25 and you want to create a “buy one, get one free” discount rule, so you define a discount of 50% for 2 items or more. Now what happens by default is that the plugin will take 50 percent from $3.25 which is $1.625, and rounds this value to two decimals which becomes $1.63. But $1.63 times two items is $3.26 – which is one cent more than it should be in that particular case. You could just set the “Internal rounding” option to No, which will still display the unit price rounded as $1.63, but use the exact value of $1.625 internally so the cart total will be $3.25. Or you could show the exact price to your customers as well by selecting “Round to 3 decimals” above, which will show the price as $1.62⁵. By default the plugin shows you 5 rows to enter your discount rules. You can increase this globally to 10 or 20 rows if you need that many – or you can create single discount profiles with more rows as well. Enable this option to show the title of the applied rule set in your customer’s cart. Select whether you coupon accounts to be applied on top of bulk pricing discount (default) – or if you’d rather ignore discount rules when a coupon is applied. Expert mode will enable you to have rulesets that do not begin with 1 unit at 100%. Only recommended in rare scenarios. This is where you can set the rule scope for custom product rulesets. The default is exclusive, but you can change it to cumulative to count the total number across all products. Enable this if you want to show the lowest price for products with custom product rulesets. 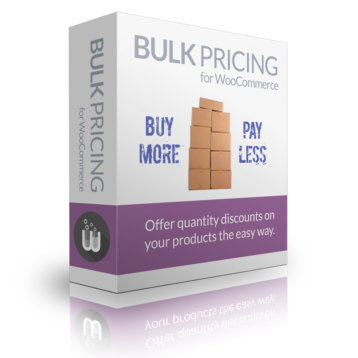 Instead of displaying the regular price from WooCommerce, this will show the lowest price prefixed with “From: ” – exactly like WooCommerce shows the lowest price for variable products with varying prices.